182 pages | 21 B/W Illus. This book explores how clothing consumption has changed in Russia in the past 20 years as capitalism has grown in a postsocialist state, bringing with it a "consumer revolution." It shows how there has been and continues to be a massive change in the fashion retail market and how ideal lifestyles portrayed in glossy magazines and other media have contributed to the consumer revolution, as have shifts in the social structure and everyday life. 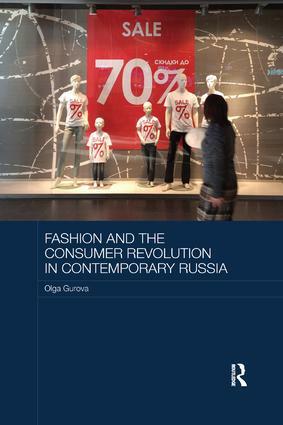 Overall, the book, which includes the findings of extensive original research, including in-depth interviews with consumers, relates changes in fashion and retail to changing outlooks, identities, and ideologies in Russia more generally. The mentioned changes are also linked to the theoretical concept of fashion formed in postsocialist society. Olga Gurova is an Academy of Finland research fellow, Department of Social Research, University of Helsinki, Finland.